(VICP-65222) first release 2014 Victor Entertainment, Japan. Track 03, 05, 06, 07, 08, 10, 12 and 16 produced by Ace Frehley. Track 01, 09 and 15 produced by Ace Frehley and Warren Huart. 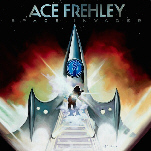 Track 02 and 15 produced by Ace Frehley and Alex Salzman. Track 04 produced by Ace Frehley and Ronnie Mancuso. Track 11 and 13 produced by Ace Frehley and Ken Gullic. Mixed by Warren Huart, assisted by Phil Allen at Spitfire Studio, Los Angeles, CA. Recorded at The Creation Lab, Turlock, CA; The Hideout, Las Vegas, NV; Ace In The Hole Studios West, San Diego, CA; The Green room Studios, Los Angeles, CA; Spitfire Studio, Los Angeles, CA. Engineered by Mike Everett, Alex Salzman, Ronnie Mancuso, Mark Greene. Mastered by Adam Ayan at Gateway Mastering & DVD, Portland, ME.